Photosensitive seizure warning: This game includes bright and flashing lights that may cause headaches or seizures. Play with caution. 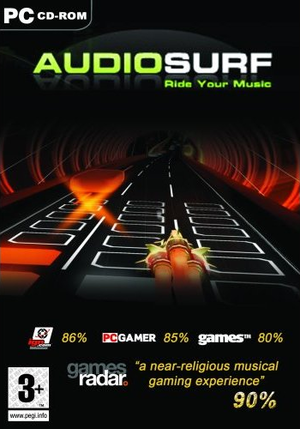 This game uses songs found on your computer, or the four songs available on Audiosurf Radio. Supported file formats include MP3, OGG, FLAC, WMA, and M4A (iTunes). 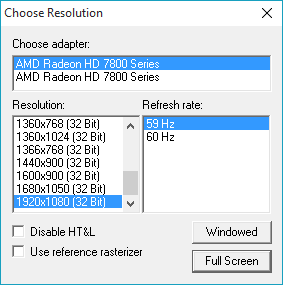 Can be freely resized. Only extreme aspect ratios may cause distortion. 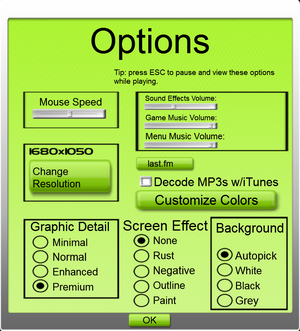 Go to Options, Customize Colors and set a distinct color for each type. ↑ 2.0 2.1 File/folder structure within this directory reflects the path(s) listed for Windows and/or Steam game data (use Wine regedit to access Windows registry paths). Games with Steam Cloud support may store data in ~/.steam/steam/userdata/<user-id>/12900/ in addition to or instead of this directory. The app ID (12900) may differ in some cases. Treat backslashes as forward slashes. See the glossary page for details.